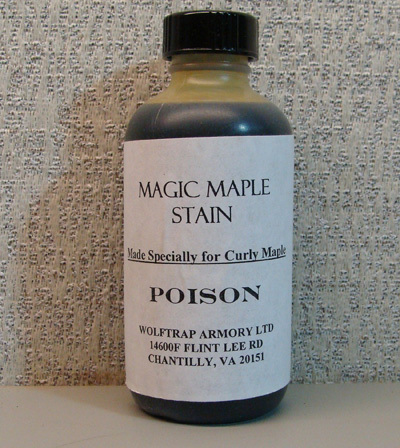 Magic Maple Stain is a water-based acid stain that has been sold commercially since 1955. The original formula was created by Ken Thompson of Slippery Rock, Pa to highlight the curl on maple gun stocks. antler, horn and some straight-grained hardwoods. Dunlap Woodcrafts acquired the formula from Ken Thompson in 1988.
reason, we will tell you how it has been used, rather than provide you with specific instructions. Magic Maple is most used in wood and horns, but not limited to these materials. and maintain bottle out of the reach of children. Please get acquainted with the stain by putting it on trial wood sample pieces. As you experiment with the samples, write the procedures and the quantities used. Magic Maple comes in the bottle fully concentrated. the full strength formula will darken most American hard woods. Full strength is recommended for antiquing military musket stocks or for used on horns. For the staining of a gunstock, the recommendation would be: 1 part stain, 5 part water. wait 15 minutes and observe the obtained effect. If the depth of darkness is too much, add one more part of water and try again. depth of darkness desired is obtained. musical instrument or piece of furniture. Magic Maple is a formulated stain that contains an acid agent to oxidize the wood fibers. This agent some times remains active and brings a green cast tint to your finished project. achieved the right contrast tone in curly maple, a secondary stain should be applied. and adjusting it using yellow, red, orange and a bit of black. This is only a guideline not instructions on how to finish. You may also use any other oil base finish such as Tung oil.